How nice to have on hand fresh fragrant herbs that at any time you can pick directly from sill and immediately sent to the soup. But what about those who have no window sill? Or whether it is used for other useful purposes, and space for pots absolutely not, do in this case it is necessary to abandon the idea of ​​growing domestic greenery, certainly requires constant contact with sunlight? Of course not! 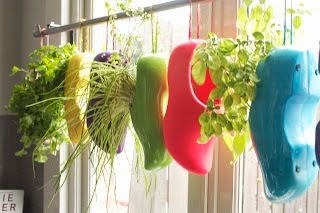 After all, the window can arrange pots and other means, for example, hang them on the window sill, so you get the "garden", to save space in the kitchen and at the same time amused households original decision. As you may have guessed, as the pots we serve Klomp - Wood shoesOnce common in Europe, and is now a kind of symbol of Holland. 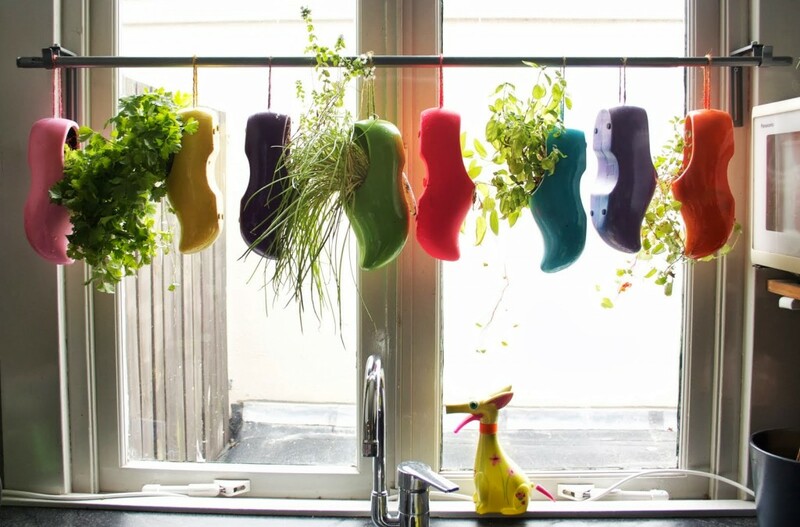 They can also be made of ceramics that for growing herbs most successful - Green protects against decay, but in this case we use the traditional wooden shoes. In order to give our "pot" a funny look, paint them in different bright colors, depending on the interior of the kitchen can also be redecorated Klomp lace, beads, ribbons, etc. Love to draw? Show off your skills in the future pots for herbs - create your own unique design. And to further can be hung on curtain pots, do a backdrop slippers hole and slip the rope through them strong. Well, ornamental flowerpot ready, but now need to figure out how to hang them above the sill. It's simple: take BETIDLIGIs attached on both sides of the window, after which they have cornice HUGAD. That's all there is left only sit home on grass this original pot and hang them on the curtain. 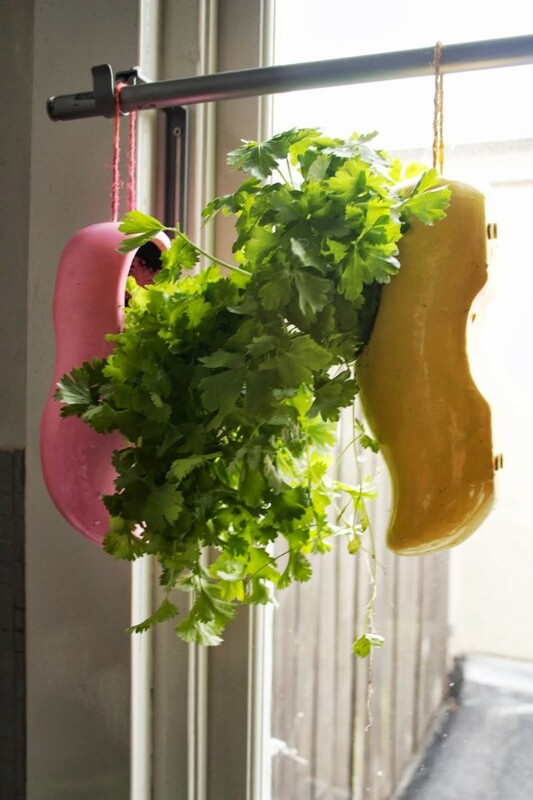 Now herbs will always be at your fingertips, and you do not have to run after them to the balcony. The kitchen is filled with aromas of summer, and the guests, Newbie to your tea will be amazed at what kind of dad Carlo visited at home - has left a heap of slippers, of which also grows dill and parsley. In general, a great charge of mood provided to all!